Add some fun to your next family meal with Aunt Bee's 20-Minute Hawaiian Haystacks! 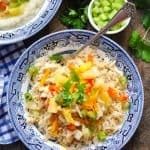 A simple chicken gravy is served over a bed of rice and finished off with all of your favorite toppings for a kid-friendly, healthy and easy dinner recipe! Add some fun to your next family meal with Aunt Bee’s 20-Minute Hawaiian Haystacks! 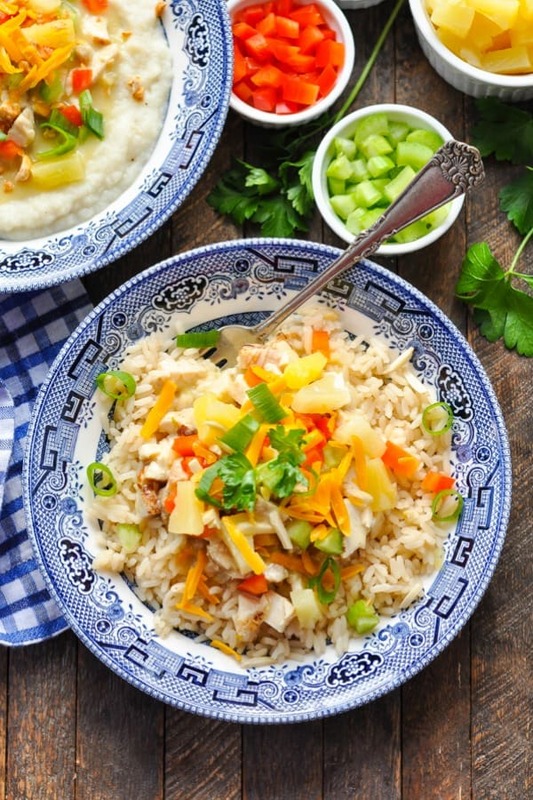 A simple chicken gravy is served over a bed of rice and finished off with all of your favorite toppings for a kid-friendly, healthy and easy dinner recipe! I’ve learned that children are much more likely to enjoy their food when they are involved in the preparation. 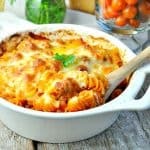 That’s why this meal is such a hit with the little ones! They can customize their own dish and make their Hawaiian Haystacks exactly how they like them! 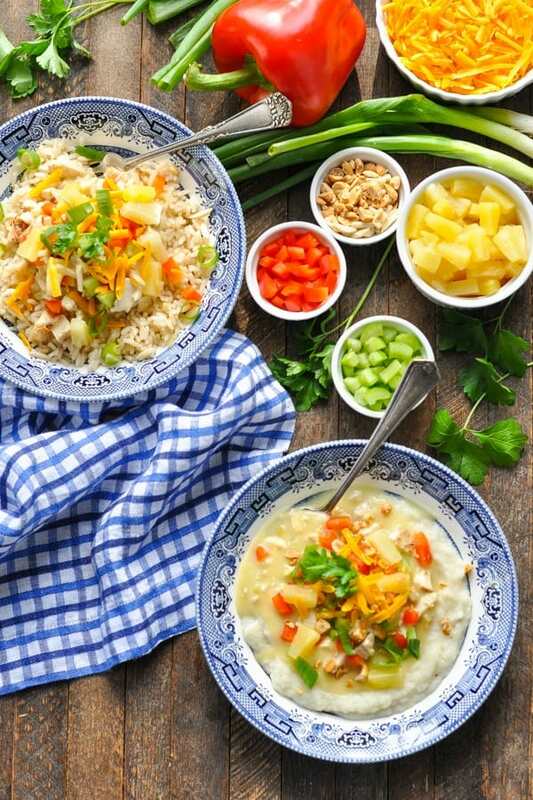 Hawaiian Haystacks are sometimes called “chicken sundaes,” and include a creamy chicken gravy served over rice. 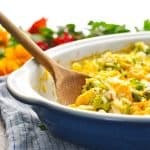 Toppings such as diced pineapple, Chinese chow mein noodles, and fresh vegetables are set out buffet-style for diners to pile on the chicken. While the haystacks recipe did not actually originate in Hawaii, the dish gets its name from the Hawaiian-style of some of the popular toppings — including pineapple and shredded coconut! 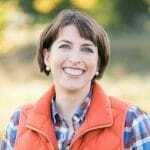 This recipe actually goes back to my mom’s godmother, Aunt Bee, who has been kind enough to send me many, many care packages over the past few years. From her home in South Carolina, I regularly receive envelopes full of some of her favorite family recipes from decades past, as well as dishes, table linens and other beautiful heirlooms that she knows I will enjoy. 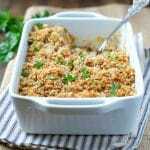 The recipe is very easy, so you can prepare everything in advance and then just warm the chicken gravy before serving. 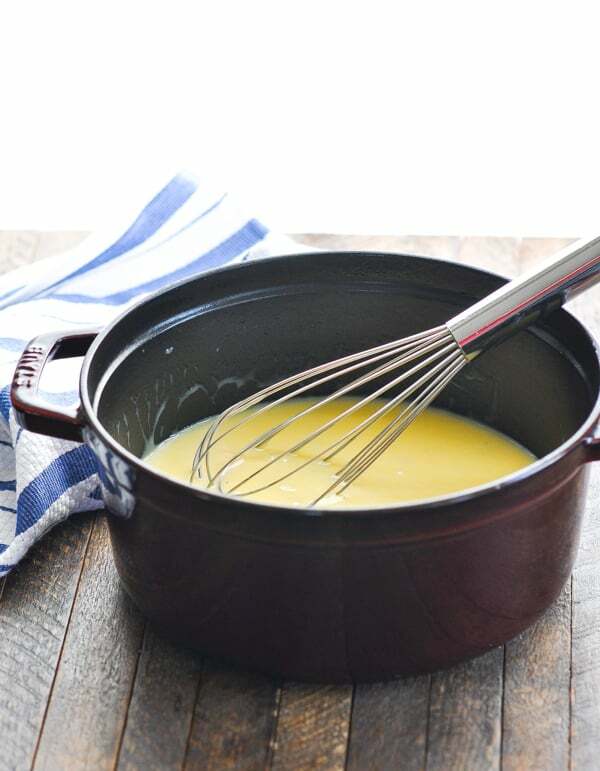 First, whisk together soups and broth in a large pot until smooth and warm. Add the cooked chicken and simmer just until the gravy is heated through. That’s really the extent of your work! Then it’s just a matter of setting out the remaining ingredients and assembling the Hawaiian Haystack Chicken! 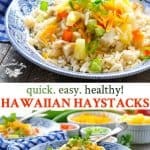 What to serve with Hawaiian Haystacks? 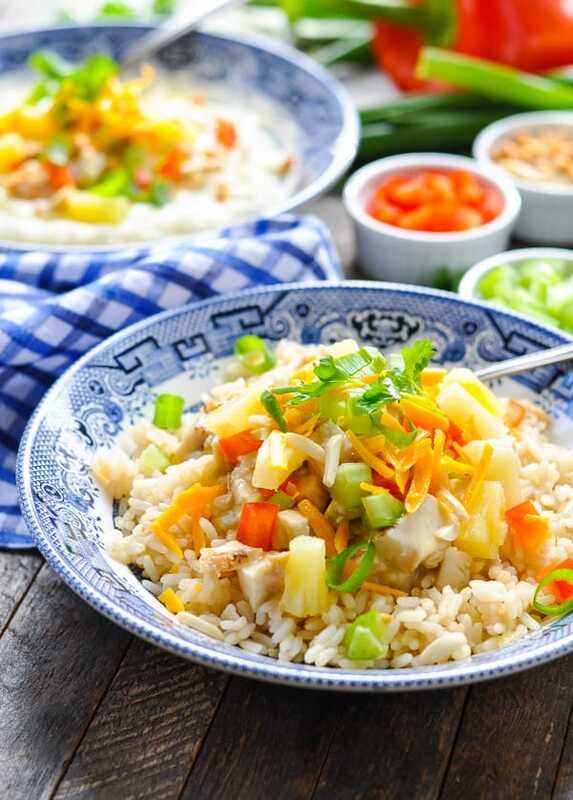 Traditionally, the chicken sauce is served over a bed of rice; however, if you’re looking for other options, try mashed potatoes, riced cauliflower, or mashed cauliflower. 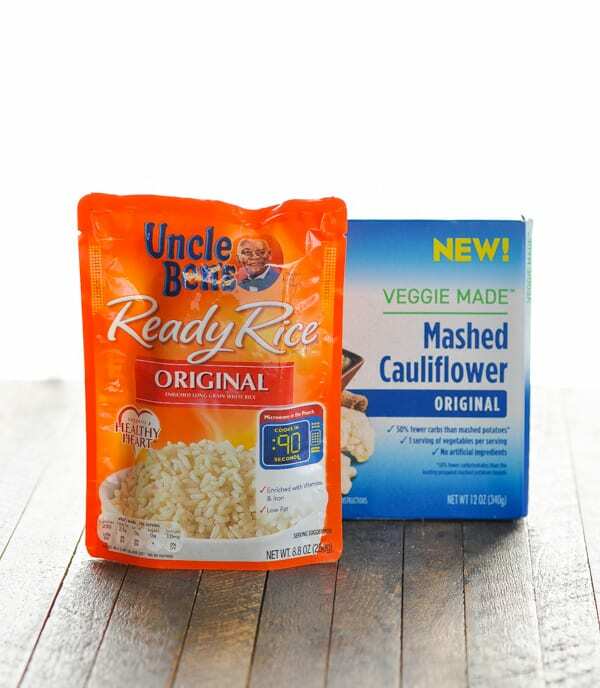 The riced or mashed cauliflower is a great way to lighten up the dish! 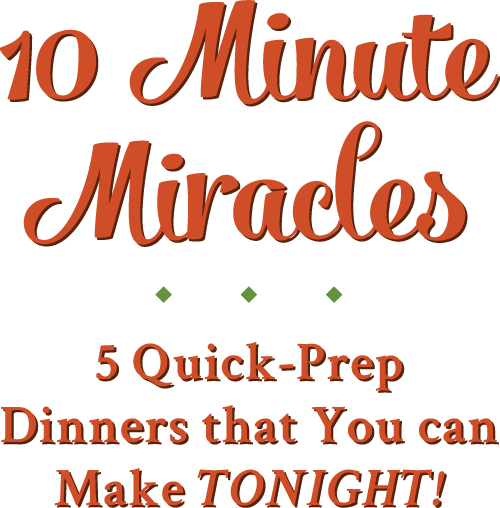 You can obviously prepare your own rice or mashed potatoes from scratch, or you can use a shortcut like these microwaveable options for busy weeknights! What toppings go on Hawaiian Haystacks? This is where you can have some fun, because the options are endless! 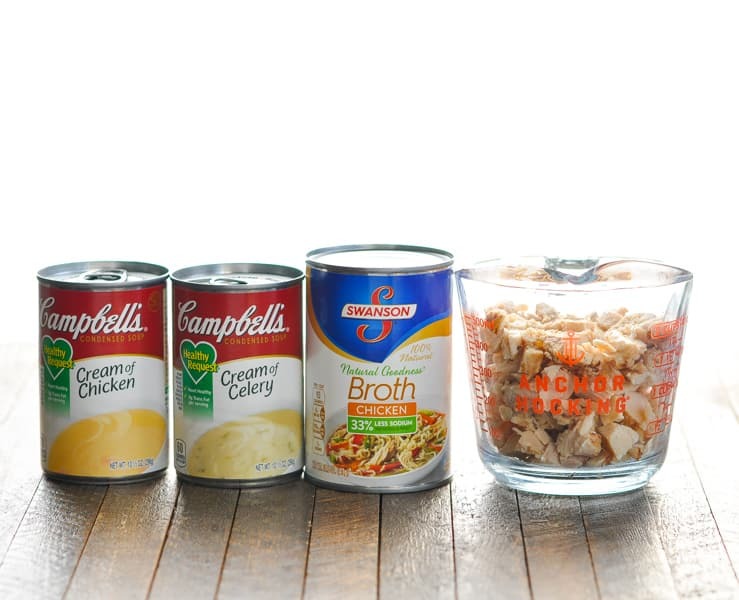 You can set out a huge table full of options, or just grab a few of your family’s favorites. This recipe calls for cooked, diced or shredded chicken. You have a few good options, including a store-bought rotisserie chicken, store-bought cooked chicken strips (such as Perdue Shortcuts), leftover chicken from another meal, canned chicken, or chicken breasts that you cook at home on your own (in the oven or in the slow cooker). If you want to bake your chicken in the oven, line a dish with foil (for easy clean-up) and spray it with cooking spray. Place chicken breasts in the dish, rub them with a very small amount of oil, sprinkle with salt and pepper, and cover tightly. Bake at 425 degrees F for about 25-30 minutes (maybe longer if your chicken is particularly thick). 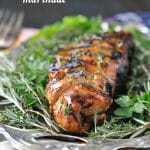 Allow the meat to cool slightly, then just shred, slice, or chop. Serve the chicken gravy over any cooked rice of your choice. You can use brown rice, white rice, or wild rice. 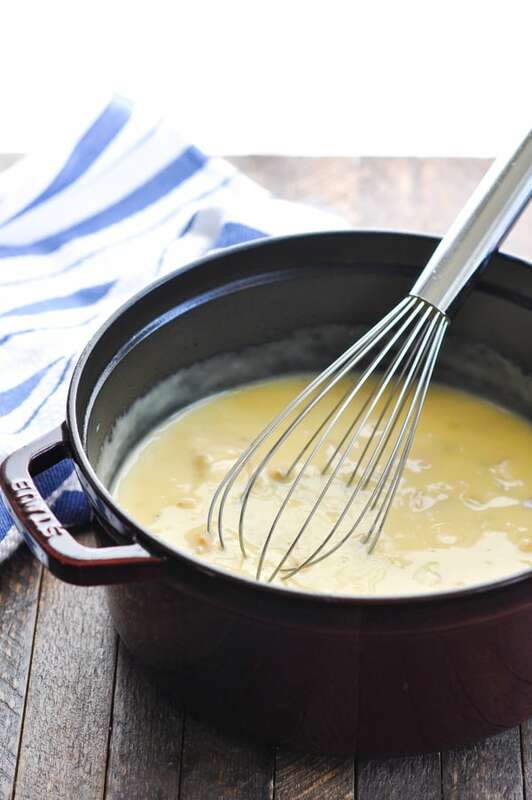 As an alternative, try serving your chicken gravy over mashed potatoes! Lighten up the dish by using cauliflower rice or mashed cauliflower instead of regular rice or potatoes. In a large saucepan over medium heat, stir together soups and broth until smooth and hot. Add cooked chicken and simmer over low heat until warmed through. Place toppings in individual bowls and set out on the table. 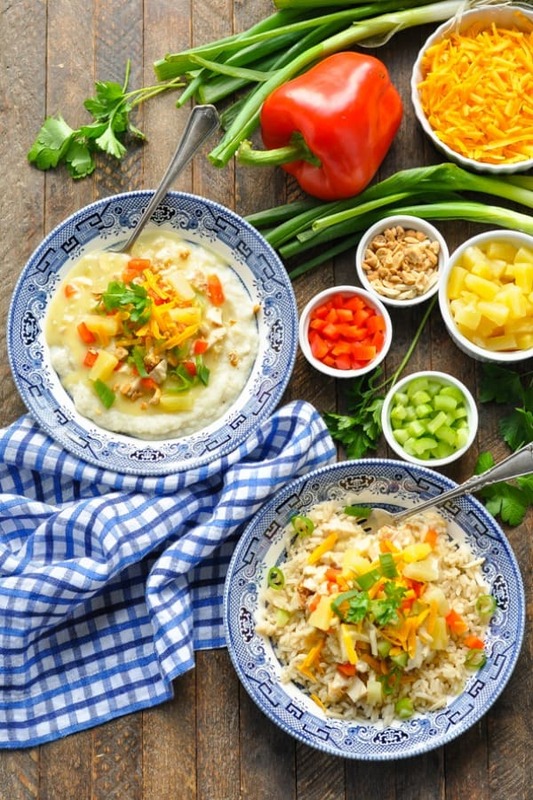 Divide rice (or cauliflower rice, mashed potatoes or mashed cauliflower) between individual bowls. Spoon chicken gravy over rice. Allow each person to add desired toppings. Nutrition information is an estimate for 1/4 of the chicken gravy. This does not include any rice, cauliflower rice, mashed potatoes or mashed cauliflower. Toppings are not included in this calculation either. This recipe was originally published in May, 2015. It was updated in February, 2019. This is such a great idea, Blair! I’ve never thought to lay out different kinds of toppings, so I’m loving this. What a fun way to jazz up chicken, especially for kids! Thank you, Sarah! It’s definitely old-fashioned total comfort food. And just fun! These look incredible! My family would absolutely LOVE them! Thanks, Haley!! They are definitely family-friendly! Thanks for the pin, Miz Helen!! I can’t believe I almost missed sharing this this week….my apologies, Blair. It’s up on my Facebook page now! I love your family recipes!